Errol: Dear NanoWorld, I tried. 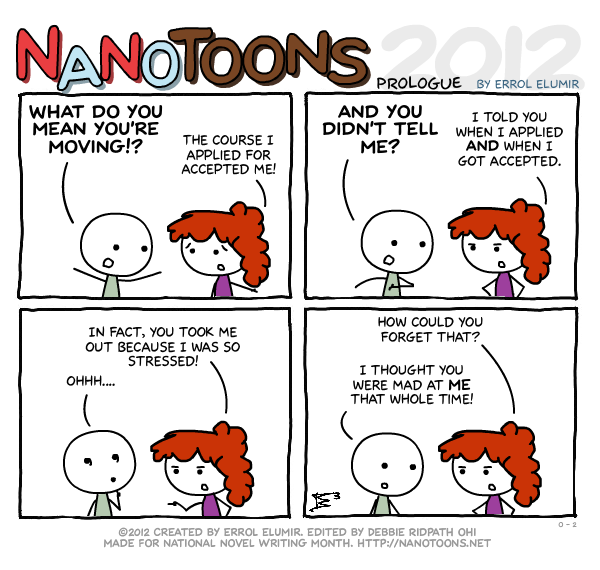 If you read this comic, you will notice that it has no mention of NaNoWriMo at all. Some of you are new to NaNoToons and have no idea the background. Well, Nano hasn’t started yet, has it? Why don’t you go and read NaNoToons 2011? There are only about 40 of them! Maybe 45. However, we do try and make the Nanotoons accessible to everyone doing NaNoWriMo and this comic doesn’t really fit the bill. So let me tell you a story. The year was 2010. I came on as a fledgling cartoonist to help out the immensely popular Debbie Ohi. She was busy with illustrating books or something like that, so I begged her to let me help out and she acquiesced! And it was a resounding success! I think. I don’t really know, we never kept metrics on it. However, if you get to the end of 2010, you will notice that the toons end a bit abruptly. We ran out of time, and we ran out of plot. And so I ended it with a Still Alive Parody and called it a day. But it was unresolved; it was unfinished. And I didn’t want it to be! I vowed never to do that again, so when 2011 came along, I wrote up a 15 comic prologue so that people could catch up on their lives and no one would be wondering what had happened with our intrepid Nanoheroes. And this year is no different. So bear with me, new NaNoToon fans! We will not alienate you! Wow, this went on longer than I expected. Have a great day and I hope your nanoprepping is going well!